The Pinery in Parker Colorado is one of the most beautiful home communities in all of the Denver Metro Area. The lots are very large and tree studded with magnificent ponderosa pines and aspens. Much of the Pinery is built around the 27 hole golf course of the Pinery Country Club. Open space is found throughout the Pinerys neighborhood with all kinds of wildlife, including deer, foxes, squirrels, rabbits and birds such as hawks and owls. It's truly a "back to nature" community. 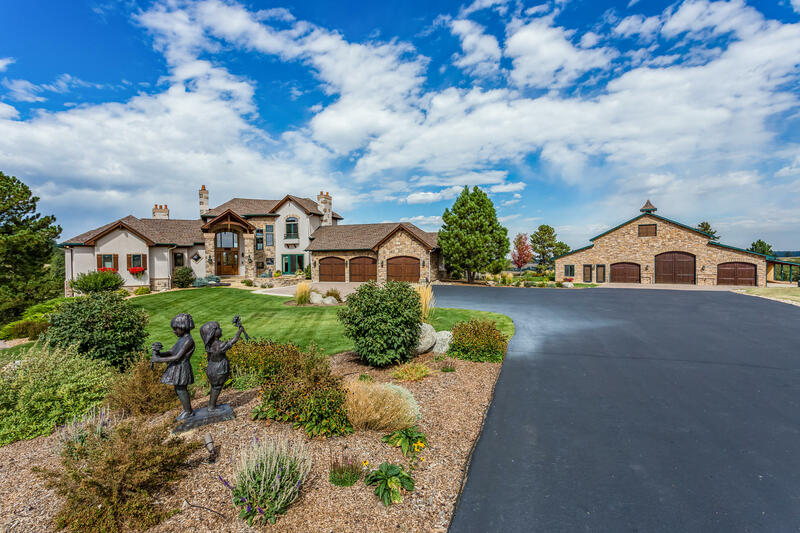 Many of the homes sit on lots that provide magnificent views of the Rocky Mountains from Pikes Peak to Longs Peak. Even those homes without mountain views usually will have very aesthetic settings. The Pinery is located about 5 miles south of downtown Parker Colorado. Commute time to the Denver Tech Center is about 30 minute. It's another 20 minutes to downtown Denver. DIA is about 45 minutes. Who were and are the home builders in the Pinery? All of the homes in the Pinery were custom built homes. No two homes are alike. What are the ages of most of the homes in the Pinery? Most of the homes in the Pinery were built in the 1970's and 1980's. Many, if not most of these, have been remodeled and updated over the years. Homes continued to be built in the1990's and 2000's. Today, only a few lots remain unbuilt on. What are the sizes of the homes in the Pinery? When you include the basement square feet (most are finished), homes range from about 1500 square feet to 5000 square feet, with most homes in the 2000 to 4000 square feet range. How much do homes cost in the Pinery? All of these homes are custom. Most are priced from about $400,000 to $600,000. To get a current report on Actives, Under Contracts and Solds, check out our Pinery Market Report. Click here to go to the report. Are there any country clubs near the Pinery? Yes. There are three great country clubs The Pinery Country Club is located in the Pinery and offers a 27 hole golf course and some of the best tennis facilities in the state. The Colorado Golf Club is adjacent to the Pinery and ranks as one of the premier golf courses and clubs in the nation. And, the Club at Pradera is a couple of miles away with a magnificent links style course and beautiful club house. What about public golf courses near the Pinery? There are numerous public golf courses nearby, including Black Bear Golf Course, Red Hawk Ridge Golf Course, The Ridge at Castle Pines and Bear Dance Golf. There are other less known courses, but these are all awesome, some nationally ranked. What about the schools that serve the Pinery? The Pinery is located in the acclaimed Douglas County School District, which is one of the top school districts in the nation. All of the schools are in or adjacent to the Pinery., making it very easy on the parents. The first elementary school is Mountain View Elementary. From there, the kids go to Northeast Elementary. The middle School (Junior High) is Sagewood Middle School. And the high school is Ponderosa High School. Additionally, there are several wonderful private schools within commuting distance, including Ave Maria Catholic School, Lutheran High School, Southeast Christian School and Regis Jesuit High School. What and where are the nearest hospitals to the Pinery? There are three major hospitals within easy commute of the Pinery. Castle Rock Adventist Hospital is located about 15 to 20 minutes away in the Meadows in Castle Rock. Sky Ridge Medical Center is located about 30 minutes way in Lone Tree. And, the closest hospital is Parker Adventist Hospital, about 15 minutes away in Parker. All three hospitals are relatively new and considered among the best in the Denver Metro area. This is a video we did while driving through the Pinery. With a GoPro on the front of our car, we slowly drove the streets of the Pinery, videoing the homes, parks, views, etc.. Watching this video, you are able to experience the Pinery as if you were actually here.